This are quiet around here- not much going on. Having my morning coffee and noticed the sun prancing through the hydrangeas. I didn't see any bees but I noticed a lot of ants on them today. First signs that these are starting to turn to the next stage of color. One of the late blooms on the Endless Summer Hydrangeas. 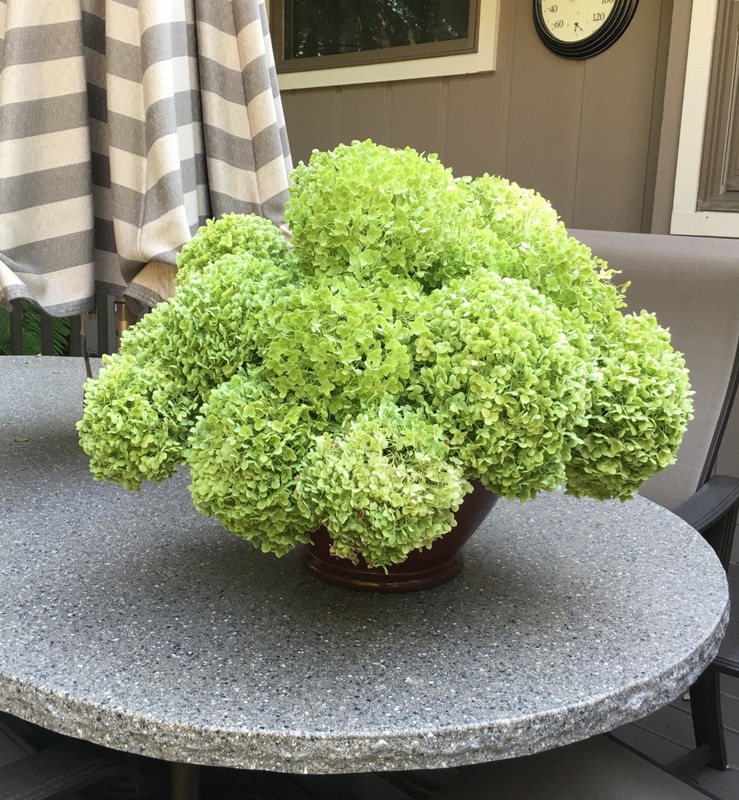 I cut a lot of my Annabelle hydrangeas and staged them in this pot to dry. I walked out back for a few pics of the fountain. I took a quick video you can watch and listen! It was longer but a big noisy truck went by on the road and ruined the sound so I had to trim it. Evening shot with the sun once again! I need to get productive and dig my iris out and split them up as well as move a few other plants I have in mind. Right now I just feel like looking at it all and not working on it! Hope you have a great weekend and don't "Labor" too hard over this Labor Day Weekend! beaytiful hydrangeas, and quiet garden ! Liz, Your garden looks like the perfect spot to escape the summer heat, surrounded by all your trees! I love seeing the video, I could happily stay outside there and enjoy all my meals with your beautiful flowers and lush green leaves. We don't have much shade and it has been sweltering this summer. Your Annabelle hydrangeas are beautiful, I need to plant some! Liz your gardening skills are top notch and the garden is the proof. So beautiful. Would you share a little about the fertilizer you use for your hydrangeas and timetable? Does your town/city have garden tours for various organizations? You would be in great demand. Thanks for sharing here with all your followers. Liz, your garden is so beautiful and the video really makes me want to sit a while. Gorgeous hydrangeas. BTW, I need it to cool off here in Kentucky so I can work in my yard and get some work done.